Metro Intelligence Investigation Agency, has one the most comprehensive network of criminal researchers, online applications, and system-to-system interfaces, you will have a screening background service company that’s easy to work with, thorough and fast. Run a Background Check on Someone and Be Safe…. A Pre-Employment Background Check has become such a necessity, even more so today. There are far to many employee’s that make false claims on their job applications and resumes to attempt to cover up prior criminal activity. 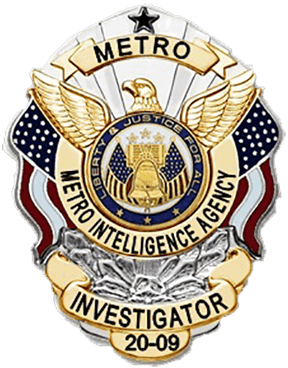 Metro Intelligency is showing a little of these “statistics’ and why it is important to do a Employment Criminal Background check or just Criminal background check to be safe “period”. 10% of County Criminal Record Checks had serious flags. 10% of Education Verifications had serious flags. 23% of Employment Verification’s had serious flags. 44% of Driving Records had serious flags. Why? Background Checks on someone? To uncover information about arrests, convictions, and incarcerations (a criminal background check), most information will be in the public record. To find this information, visit court and other government websites to access these documents. But, here is one that will really start to guide you and never stear wrong “Wikipedia” . Or you could go to google -Type “criminal records” and then your state into a search engine and start your endless search. Better yet, working with a third party Private Investigator service ensures all reporting and disclosure rules are followed to the letter of the law. Either way, Metro Intelligence agency background information will help paint a picture of the person based on there previous past habits.